In the flurry of activity surrounding Cone, I managed to have several conversations with Wolfgang about the work. He spoke of his previous architectural-scale projects where he increasingly recognises that it is important that people make sense of the artwork themselves; from the apprentices who help construct it, to the people who view it. The apprentices, for example, gain a different appreciation of their skills and trade. Though they perform many of the activities as they would building a house or a wall, an art project brings in a different set of values. Art is something for itself, not for someone to live in. This is reminiscent of Richard Sennett’s observations in the Craftsman (2008), which stresses the value in a job done well if only for the sake of craftsmanship. Wolfgang spoke of House-City (2003), an earlier piece that was constructed in Newcastle city centre. Cone has provided a different experience though. Firstly it differs in scale. 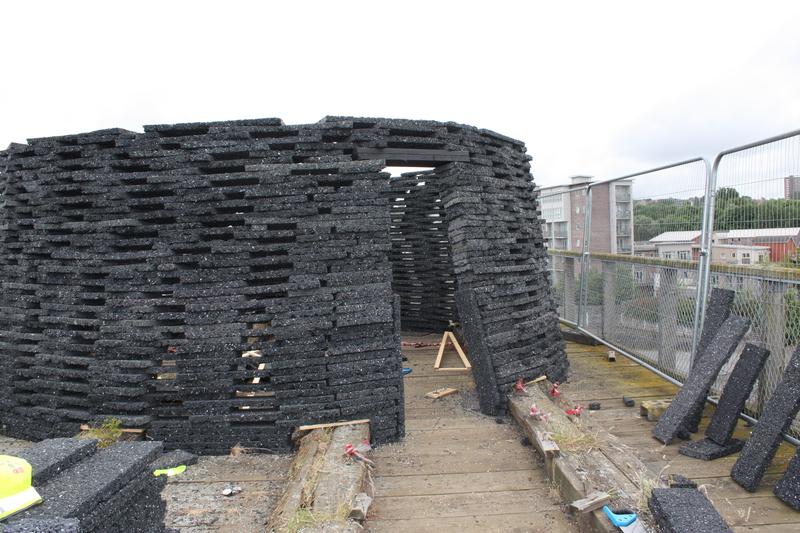 This is an AHRC funded project, which makes the execution much more complex even though the scale of Cone is smaller than Wolfgang’s previous works. 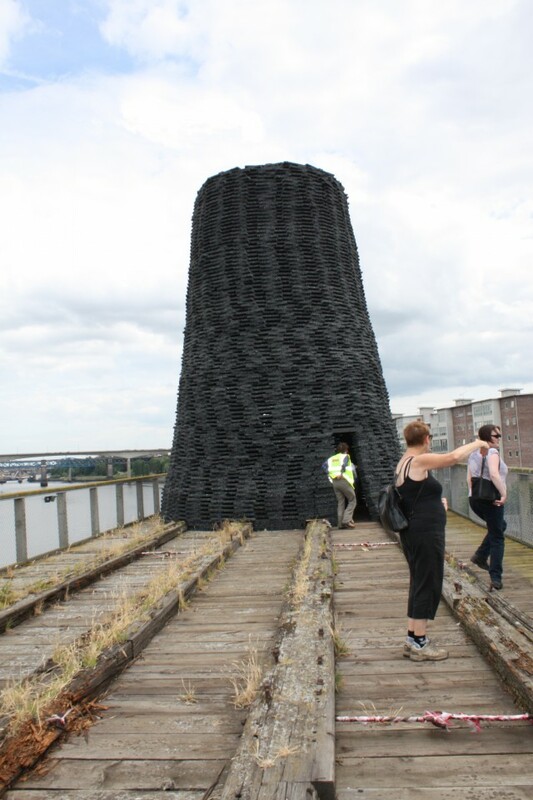 Secondly, Cone is placed on different territory – the nature of Dunston Staiths has meant that numerous planning consents and permissions have had to be in place before construction commenced. Wolfgang says that he is still learning about his art as the years and months progress. He now realises the relationships that are sustained over time, long after an artwork is deconstructed. For example, students learn new skills which has contributed to them receiving NVQ’s (Goulding 2007). Occasionally, Wolfgang has met people in mundane places who recognise him because a member of their family worked on House-City. All of this shows that art does much more than people might often think; it creates relationships between people, that may be sustained over time in the most surprising ways. Meanwhile, Cone has grown to two metres high, and the lintel is in place. 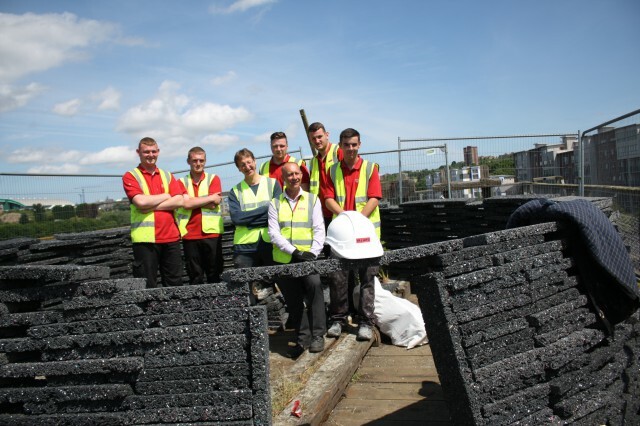 More apprentices have been added to our core team of five to help lift the Aquadyne to the top of the Staiths. If you are around, and the weather remains fine, then do pop down to have a natter with us!